When it comes to choosing the perfect lighting fixtures for the outside of your home or office, there are a variety of fixtures to choose from. These fixtures are not only functional for lighting and security purposes, but they also add a sense of beauty to your property. At M&M Lighting in Houston, we offer a large selection of outdoor lighting fixtures (at least 12 different types) as well as indoor lighting products. If you have any lighting needs, contact our team of specialists today! Wall mounts are lighting fixtures that quite literally mount onto walls. They come in a variety of designs, colors and sizes, but all should have the ability to attach to a vertical surface. This type of outdoor lighting fixture is best for lighting the places that are prone to tripping or accidents — your exterior pathways, walkways or stairways. Though this type is more for security and safety purposes, it can also serve a decorative purpose as well. Sconces are a type of wall mount, as this lighting fixture can mount onto a vertical surfaces. The light from a sconce typically shoots upward, and this type of lighting fixture comes in a variety of designs, such as lantern, half-moon, candle and more. They can also come in traditional, modern and rustic styles. Sconces are most commonly installed at your property’s front entrance, on its exterior walls, or near any outdoor stairways. Spot lights are a type of wall mount mainly utilized for security purposes. For example, spot lights are considered a certain type of flood lighting, seen near garages, driveways or parking areas. These lights can also be used to showcase any landscaping. Hanging lights are also known as pendant, drop or suspender lights, mostly because they do just that — hang from the ceiling. They serve mostly decorative purposes, and are most commonly seen in places such as outdoor kitchens, patio dining or gardens. They can be a single light or can be hung in a pattern of multiple lights, and they come in a variety of styles as well, such as rustic, transitional, contemporary and more. A type of a hanging light, chandeliers differ in that they usually have multiple lights on one suspension chain or cord. 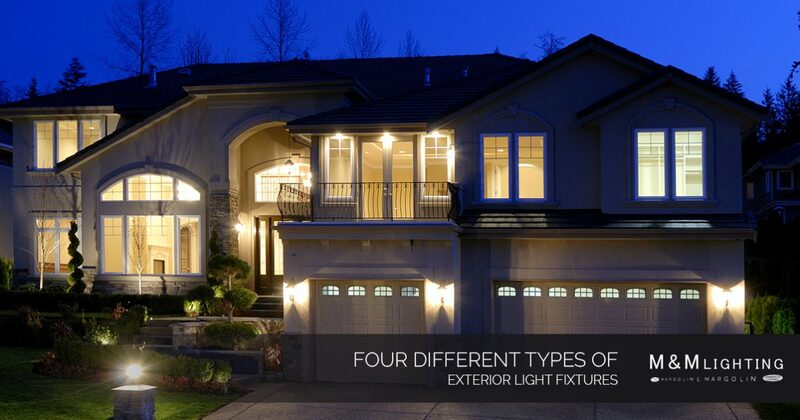 They add a sense of elegance to the outside of your home in a way just one hanging light can’t. Chandeliers are perfect for highlighting an outdoor dining or seating area. Outdoor fans could be a type of wall mount or hanging light, depending on the type you choose. Some can be installed into an outdoor area’s ceiling, while others can connect to a single wall. They are a practical choice for an outdoor patio area, as they can cool the area down in the summertime, making any outdoor parties or barbecues more enjoyable. Ceiling mounts attach to the ceilings of any of your outdoor spaces, rather than your home’s vertical wall structures (like wall mounts). They are intended to illuminate your exterior from above, and their purpose is mainly decorative. This type of lighting fixture is most commonly found at a property’s entryway, or on any porches and gazebos. It’s unique in that it is connected fully to the ceiling without any gaps, like you’d see in a hanging light or chandelier. This type of exterior lighting fixture is used to illuminate your home or property’s landscaping features, whether that’s a garden area or outdoor pathway. It’s most commonly used in the front of a home, to define pathways and walkways, or to showcase a home’s gardens and trees. Landscape lighting serves two main purposes: Safety and decoration. At M&M Lighting, our team of lighting specialists know everything there is to know about lighting, from design to functionality. You can count on our professionals to find you the perfect outdoor lighting fixtures that fit within your budget. We have been a top distributor for lighting fixtures and ceiling fans in the greater Houston area for more than 50 years. For more information, call us at (713) 469-3002 or visit our Houston showroom today!